For many of us, happiness is the heady smell of a freshly opened book and a sunny spot to relax outdoors, and the library has always been a place that can contribute to that feeling of contentment. Many modern libraries are now incorporating natural elements into their interior designs, creating another form of peaceful retreat for their users, as well as creating functional outdoor spaces for socializing. 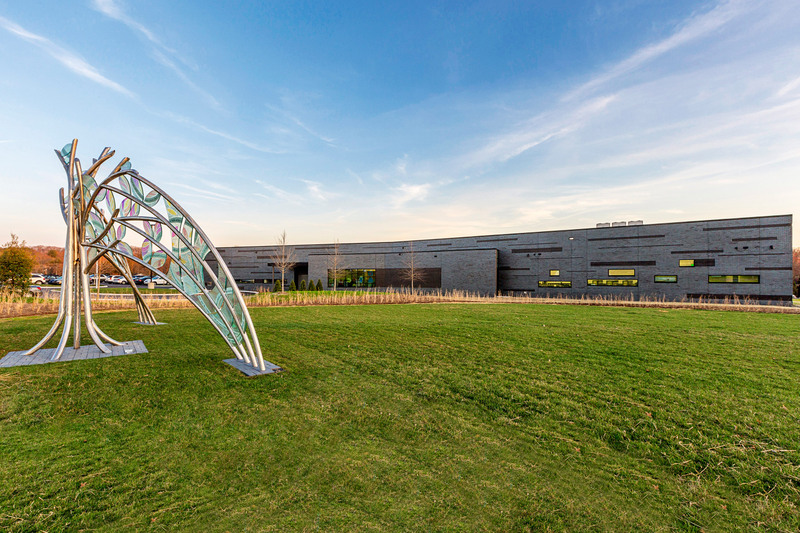 Traci Lesneski, head of interiors at MSR Architects and an expert in designing learning spaces, notes that outdoor public spaces that are clean, comfortable, and supportive of activity encourage people of all ages to meet up. She adds that providing options such as strong Wi-Fi and multiple areas, including sun, shade, and private and communal spaces, encourages people to seek outdoor seating areas and use them for work, meetings, and projects, as well as reading and contemplation. Opening it doors in 2015, Nashville Public Library’s Bellevue Branch, designed by Hastings Architecture Associates, embodies these concepts, featuring both usable outdoor spaces and indoor spaces that integrate nature into their design. Katherine Bryant, Bellevue Branch Manager, describes below how the library’s designers planned areas for patrons to relax as well as areas for them to be active, all while keeping the needs of the community in mind. The site for our new library was formerly a large field with a track around the perimeter and a stand of hackberry trees. The Bellevue Middle School students and the community at large used this site for playing, picnicking, exercise, and, yes, even reading. We knew that by building a 25,000-square-foot facility on the site, we were permanently altering an area that the community valued. We wanted to preserve access to as many of these activities as possible. Our outdoor spaces include a walking path, a reading porch and a large lawn area. The walking path is well used by community members seeking a safe space to exercise and walk their dogs. We even included a doggy water fountain along with the people water fountain! The path is lined with benches, more than 120 trees, and native grasses, creating a pleasant space to enjoy some fresh air. 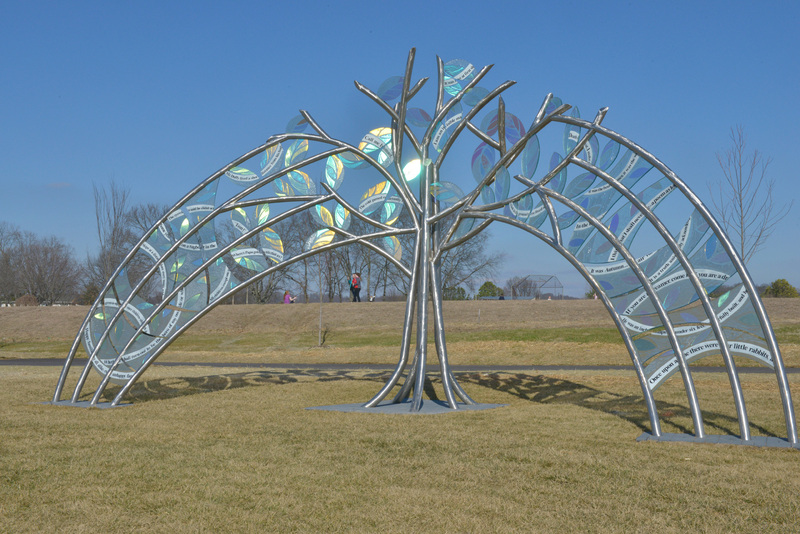 The steel and dichroic glass piece, “Great Beginnings,” evokes the hackberry trees that once stood nearby. The reading porch is a covered space that features seating for more than 30 people, access to our free public WiFi, and a pretty view of the neighborhood. Community members come to the library early to sit on the porch and enjoy coffee while reading or using their laptops. Our teenage patrons especially love hanging out on the porch after school with their friends; they can release some of the energy of the day without being ‘shushed’ by librarians! The lawn is another beautiful outdoor feature, where children can run around, families can picnic and the library can host programs. 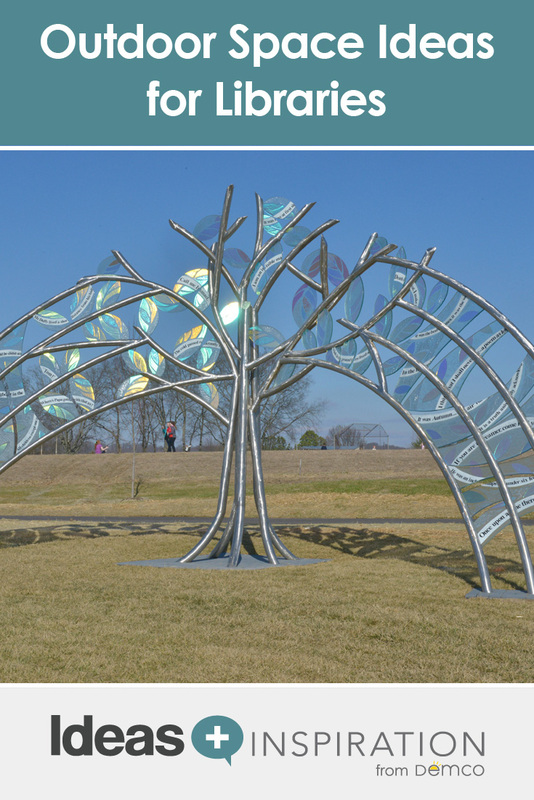 In addition to the natural landscaping, the lawn features the sculpture “Great Beginnings,” a steel and dichroic glass piece by Beverly Stucker Precious that evokes the hackberry tree our community loved so dearly. The sculpture’s tree trunk and branches are made of steel, while the leaves are made of dichroic glass, which seems to change color throughout the shifting light of the day. The leaves have first lines from books woven throughout, which were selected by the community. We also brought the outdoors inside through the public art installation “Rise Above,” by Brenda Stein, and through the use of natural light throughout the building. Our library features huge windows that, even on the gloomiest days, seem to brighten the space. My favorite time of day here is at dusk, as the sun is setting through our west-facing windows, the whole building glows. 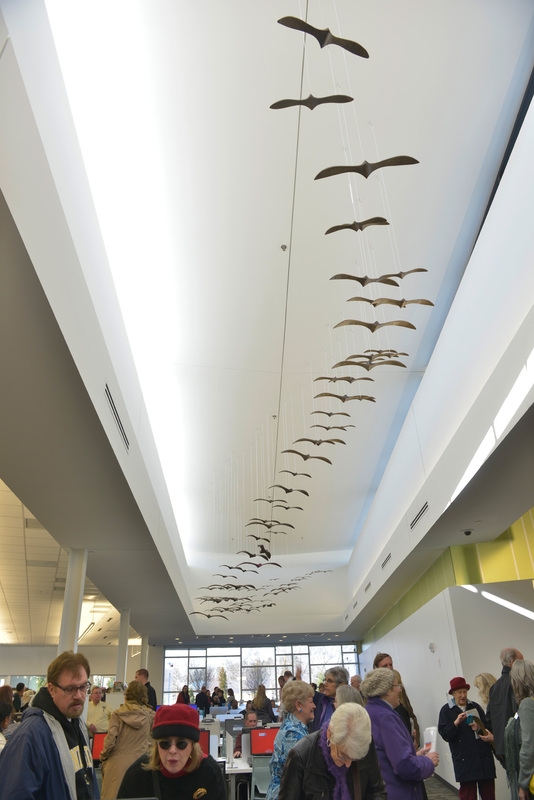 The “Rise Above” installation is more than 80 wooden abstract birds soaring through the center of our building, immediately visible to all who enter. The Metro Public Arts Commission saved the wood from the beloved hackberry trees that had to be removed for the library’s construction and worked with local Bellevue wood-turner and sculptor Brenda Stein to create this ode to the tree. Brenda used to bring her children to our old library and was overjoyed to play such a major role in the aesthetics of the new building. She has participated in several events at the library, including Meet the Artists programs and Tennessee Craft Week demonstrations. The birds in the “Rise Above” installation are carved from wood from the community’s beloved hackberry trees. 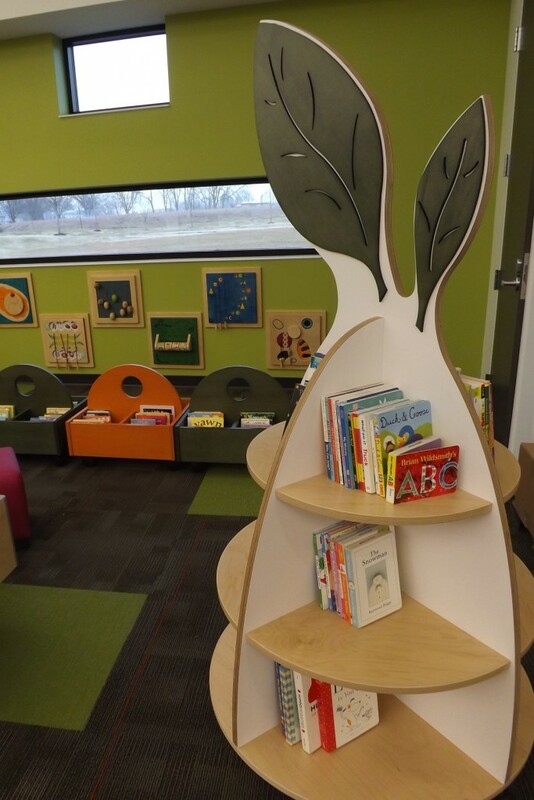 Leaf-topped bookshelves carry the nature motif into the children’s area. The biggest surprise has been the use of the reading porch by our teenage patrons. We have a Teen Room, including Studio NPL equipment for STEAM programming that we thought would be suitable for our middle and high school students. Once we opened, however, we found that we are the place to be for this age group! We have many more students come to the library every day than can fit into our Teen Room. While 20 to 30 students participate in our daily STEAM programming, another 20 to 30 are just looking for a space to hang out with their friends. The reading porch has become their go-to space at the library. So their parents feel comfortable with them coming here on their own, but they’re far enough outside that they’re not bothering (or being bothered by!) any adults. To get inspired by more ways libraries are taking to the outdoors, visit the Demco Outdoor Library Spaces Pinterest Board. Katherine Bryant is a Branch Manager at Nashville Public Library and founder of the NPL Seed Exchange. Her work centers around community engagement through outreach, programming, partnerships and service. Katherine received her MLIS from Wayne State University and has volunteered with food justice organizations in Michigan and Tennessee. Her favorite things include cats, homegrown tomatoes, travel, hiking and dystopian fiction. Hmmmmmm! Didn’t see all this green when visiting downtown Nashville last month but I LOVED the Tower of Books sculpture in the corner! Hi Jeanne, Amazing how fast things green up when the seasons change. Glad you found inspiration with this blog post – that’s what the Ideas + Inspiration site is all about!